Dog crates are used for various reasons, from training and containment to transportation. This means that choosing the best dog crate for your needs depends not only on the size and breed of your dog but how the crate is going to be used. Kennels come in many shapes and in many sizes. However, you can probably agree that they all aren’t equal when it comes to quality. Some crates can be chewed through, some just can’t seem to keep pets from escaping and others seem too small and confined to leave pets in for any length of time. One thing is for sure though; as a dog owner you’ll need a dog crate or kennel. Before you go and pick one, take a look at our best crate comparison table, followed by reviews of our top picks. We’ve done the hard work so you don’t have to. Fits dogs: Between 71-90 lbs. Midwest’s Ultima Pro dog crate is a wire dog crate that ranges in size from 24 to 48 inches. It comes with a divider that lets you adjust the crate’s size to accommodate a growing puppy. Weighing between 22 and 59 pounds, this dog crate can be a bit heavy but is extremely strong and durable making the best heavy duty dog cage. This dog crate is also collapsible, making it a good option if you travel with your dog. Some other convenient features of the dog crate include the fact that there are doors on two sides allowing for versatile placement and two latches for each door. It has a strong carrying handle and rubber feet to protect your floors, too. The crate comes with a pan at the bottom that makes for easy cleaning and stops your dog from moving the crate around as much. While some customers have noted that assembling the Midwest Ultima Pro Series dog crate together can be tricky, others have said that it’s a great option for dogs who tend to destroy crates that are made with smaller wire. If you travel or crate your dog often, this is a great option with a one-year manufacturer’s warranty in case anything happens. If you are looking for a dog crate that is comfortable for your pet, functional and durable the Midwest Ultima Pro is your best option. Pair it with the Maxx Ultra Rugged Dog Bed or use it as a standalone bed. The number one US-headquartered home builder for pets – what more is there to say? Weight: Ranges from 11.8- 46.8 lbs. 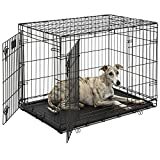 A lower priced metal dog crate for your pet is the AmazonBasics Dog Crate. Suitable for training puppies or crating adult dogs, this cage offers a safe, secure haven for your pet to rest in and relax. The crate is very easy to put together since it’s both fully collapsible, folds flat and so is portable, making it easy to take it down and set it up as one reviewer commented assembly was completed within 2 minutes. Despite its affordability, in terms of quality, Amazon Basics has almost the same quality as the more expensive kennels like Midwest. It has two sturdy latches, an easy cleaning tray and is roomy to contain a bed, food bowl and his favorite toy. The metal frame is coated so there are no exposed rough edges and there is an optional divider panel. 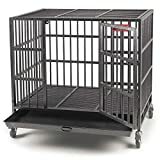 AmazonBasics dog crate continues to receive stellar ratings and is currently one of best metal dog crate in the market. Best paired with the AmazonBasics Padded Pet Bolster Bed. It’s a lightweight wire dog crate but properly built. Fits dogs: Between 91-110 lbs. Weight: Ranges from 12- 48 lbs. Midwest’s Life Stages crate is another excellent option if you’re looking for a heavy-duty metal folding dog crate. This dog crate is available in six sizes ranging from 22 to 48 inches. It comes with a divider so you can adjust it to your dog’s size as they grow and there are options for either a single or double door. For easy clean-up this crate comes with a leak-proof plastic pan and it’s made with roller feet to protect your floors. A few other cool features that dog owners love about the Life Stages dog crate is the handle that makes this crate easy to carry and transport if you travel with your dog. Two side bolt latches secure the door(s) in place. Compared to other crates made by the same company, this one has heavier gauge steel and tighter wire mesh – perfect for big dogs, destructive dogs, and escape artists. Here’s a handy video showing you how easy it is to assemble and helps you assess the quality of this crate. Dog owners love this crate because it’s affordable and comes in different sizes for all breeds. The free divider makes it perfect for owners who know that their puppy will outgrow a small crate fast. While some owners don’t like the latching system for this crate’s door(s), most customers were satisfied with this sturdy crate. If you buy it and something is wrong with it there’s a one-year manufacturer warranty too. Best paired with the Midwest Deluxe Bolster Ped Bed. Fits dogs: Up to 70 lbs. Breeds: From Extra Small to Intermediate Dogs. Weight: Ranges from 3.2- 11.1 lbs. 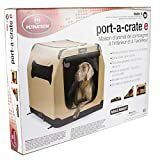 Petnation’s Port-A-Crate is a soft-sided crate that’s great for traveling, camping, and at-home use. If your dog’s crate is mainly used as a safe space as opposed to containment, this might be the right one for you. The crate, which is designed for both indoor and outdoor use, comes in 6 sizes ranging from 16 to 36 inches. The great thing about this crate compared to wire crates is that it is more lightweight. This crate is made using tightly woven mesh fabric with a strong steel frame. It’s durable but best for crate trained dogs who are no larger than 70 pounds. Since these types of crates are easier to chew through or escape from, you should always supervise your dog while they are in this crate outside of the home. Owners love this crate because it is easy to set up and take down, plus it doesn’t require any extra tools. Although it might be a little harder to clean than a wire crate, the material is waterproof. You can even take off the cover and put it in the washing machine! Dogs love this crate because it’s more private but still well-ventilated, so it makes a great space to hang out at home or on-the-go. Best paired with the Nature’s Miracle Orthopedic Pet Bed. Breeds: From Extra Small to Large Dogs. ProSelect’s Empire Dog Cage is a heavy-duty dog crate that comes in either medium or large. If you have a dog that escapes from every other crate, this might be just the one you need. It’s extremely strong with reinforced 0.5-inch diameter steel tubes, 20-gauge steel, and strong door latches. It’s also elevated with a grated floor and a steel tray underneath for easy clean-up of messes. Since this metal dog kennel is a little heavier than others it also comes with removable wheels to make it easier for you to move the crate if need be. Carrying it inside the house to set up is the biggest challenge. The Empire dog cage is best for use at home since it would be hard to transport it around because of its weight. Owners love this crate because even the toughest of chewers can’t break out of it that’s why we rate it the best crate for strong dogs on the market. While it’s a little more expensive than some other crates, this is a good crate to use if you need to contain your dog while you’re out of the house and other crates haven’t stood up to the challenge. Satisfied customers also say that this crate is easy to set up, even with just one person. Best paired the Slumber Pet Empire Cage Mat. What Type of Crate Do I Buy? This type of dog crate is one of the most common for use at home, for transportation and great to use for separation anxiety. While they can be heavy, they’re easy to break down and use when travelling. They’re super easy to clean too! Wire dog crates are great because they are sturdy, well ventilated, and allow your dog to see its surroundings. A few downsides are that they can be noisy and aren’t the best option for escape artists. Dog crates made of plastic are most commonly used for travel and are difficult for dogs to escape from. Plastic crates are convenient for taking your dog on flights and some of them can be broken down for easy storage when they aren’t in use. These crates are great for dogs who like more privacy but they aren’t as well-ventilated and are harder to clean. Soft-sided dog crates (also known as pop-up or tent crates) are less commonly used but are also good for travel. They’re generally well-ventilated and are perfect if you’re looking for compact storage. The only thing about these crates is that they’re best for small dogs, since they can easily be escaped from or chewed through by destructive dogs. Yes, decorative dog crates do exist. These crates look more like furniture than dog crates and are made to look aesthetically great in your home. They can be found for most dog sizes but compared to other crate types these are meant to stay in one spot and are not easily transported or collapsible. They can also be harder to clean and generally quite costly. Heavy-duty dog crates are more expensive but they are extremely durable and designed to keep in even the cleverest escape artists. The downside is that they can be hard to move unless they come on wheels. This is a intended only as a guide. Your dog may require a large or smaller crate than listed. Fitting Tip: Make sure your dog can stand up, turn around in, and lay down in their crate. What is the best dog crate for your pet? Finding the best pet crate for your needs can be tricky. Buying the wrong one because you didn’t do your research first can cost you a lot of money. The best thing to do is figure out what type of crate will be best for your needs and then figure out what size is best for your dog. Once you have those things decided you’ll have a better idea of which crate is your best option. I own two dogs and decided to buy each pup similar dog crates (Midwest Ultima Pro) and dog crate bed as opposed to a dog crate extra large. I am just wondering if swapping crates between the pups is allowed or should I set boundaries from the outset? If there is no problem between the two dogs swapping dog cages, then there is nothing to be concerned about. It shouldn’t really matter which sleeping crate belongs to which dog, let them figure it and work it out between them. I am in two minds about which dog crate to buy for my Beagle puppy in an apartment. A wire crate or a soft dog crate? Each of those crates are great choices for an apartment! They both have pros and cons and in most homes, many dog owners have at least two kinds. Soft dog crates are typically used for car trips, dog events or performance shows. These aren’t the most sturdiest and are designed to crate a dog for a couple of hours. The main benefit of a soft crate is that it’s lightweight and can be easily folded for transport or storage. A wire crate is the most popular choice for most dog owners and like a soft crate it folds easily for transport or storage but it’s more secure and sturdier than a soft crate. In this instance I would opt for a wire crate since it’s also easier to keep clean and maintain especially for a growing puppy who might also be regressing in potty training. Also these types of crates are useful for dogs suffering with separation anxiety. Finally, you can easily disguise a wire crate with a draped blanket or a side table.